Was the resurrection of Jesus a fact of history or a figment of imagination? Was it an event that entailed a raised and transformed body and an empty tomb? Or was it a subjective, visionary experience–a collective delusion? In the view of many, the truth of Christianity hangs on the answer to this question. Jesus’ Resurrection: Fact or Figment? is a lively and provocative debate between Christian philosopher and apologist William Lane Craig and New Testament scholar and atheist Gerd LÜdemann. This published version of a debate originally set at Boston College is edited by Paul Copan and Ronald K. Tacelli, who invite the responses of four additional scholars. Robert Gundry, a New Testament scholar, and Stephen Davis, a philosopher, argue in support of a historical and actual resurrection. Michael Goulder and Roy Hoover, both New Testament scholars, offer their support for Gerd LÜdemann’s view that the “resurrection” was based on the guilt-induced visionary experience of the disciples. 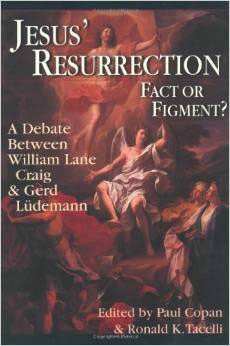 The book concludes with a final response from LÜdemann and Craig.